This is a collection of digitized Student Handbooks, the guidebooks that were presented to every student enrolled at Holy Cross. They provide information on disciplinary and academic policies, student organizations and activities, awards, and honors societies. Currently the 1925 and 1971 Student Handbooks have been digitized. The Archives staff plans on digitizing the remaining Student Handbooks in the future. 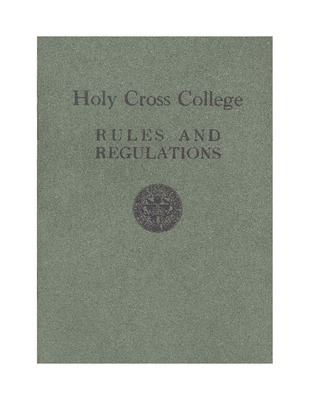 This is a digitized copy of the 1927 Holy Cross College Rules and Regulations, the guidebook presented to every student enrolled at Holy Cross. It provides information on disciplinary and academic policies. 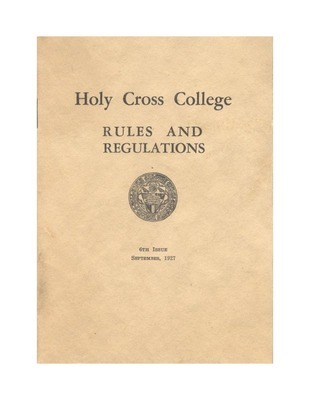 This is a digitized copy of the 1925 Holy Cross College Rules and Regulations, the guidebook presented to every student enrolled at Holy Cross. It provides information on disciplinary and academic policies.